Most of the time, companies choose wooden pallets for their shipping needs as they are by far the most common – and the more affordable – kind of pallet. But before investing in wood pallets, you should also be aware of plastic pallets as they may provide advantages over traditional pallets in certain circumstances. Plastic pallets have some great benefits, like durability and display value, and it’s in your company’s best interest to investigate both options before moving forward with either. In short, 96% of the time, wood pallets are the right solution. However, let’s take a look at the benefits of a plastic pallet to see when using one may be right for your business. Plastic pallets have a longer life than wooden pallets since they don’t rot or warp. Some estimates put the lifespan of a plastic pallet at 10+ years. Wood can be a challenge to clean unless you’re sending it through a heat treating or fumigating process, which adds to the cost of each pallet. Plastic pallets are much easier to clean and to keep clean, making them a great choice when dealing with shipments that need to meet certain sanitation requirements. Plastic pallets are lighter than wood, weighing as little as 3 lbs. This can make them easier to move around a warehouse. And, if shipping weight is a major consideration, they could be a worthwhile investment. There are no screws or nails needed to hold them together. Due to their necessary hardware (nails) along with splintered wood, they can be more dangerous to work with. Without the hardware, plastic pallets are safer to work with. To go along with the absence of hardware, this makes plastic pallets more difficult to repair. You aren’t able to replace broken pieces like you can with wood pallets. They tend to cost more upfront, but this can be made up for with longevity. A general rule of thumb states that if you use a plastic pallet for 5-6 trips, you’ll break even on cost. Plastic pallets are less suited for heavy loads than their wood counterparts. They are easy to repair and recycle. They are ideal for international shipments as your pallets won’t always be returned to you. If you have an environment that is closed-loop (pallets you use to ship are returned to you), you may want to consider plastic pallets. On the other hand, if you’re making international shipments, you may not get your pallets back and resultantly shouldn’t invest in plastic pallets as they are more expensive for a one-way trip. Plastic pallets are geared towards lighter duty applications. If you’re shipping heavy loads, you’ll want to opt for a wood pallet. 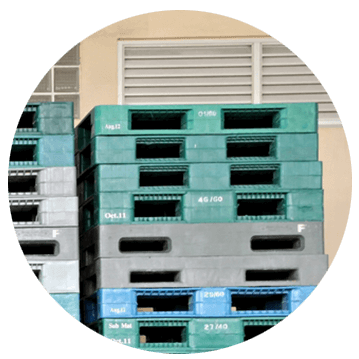 Using plastic pallets definitely has its advantages, but you want to make sure you’re doing what is best for your business both in terms of your product and in terms of your bottom line. Where Can I Buy Plastic Pallets? Direct Supply offers plastic pallets for sale! We can provide standard sized pallets as well as custom plastic pallets to meet your specific needs. Let Direct Supply be your plastic pallet supplier. Get a free quote today!